The catalogue of events involving fires and fire-fighters of the Island is immense but of those discoveries there are some that stand out for their significance in the story of the Island's fight with fire. 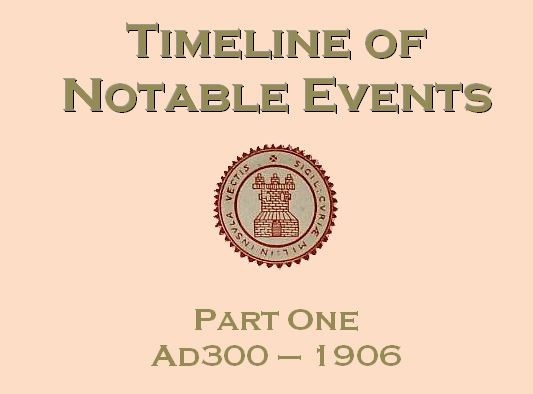 The timeline below, which no doubt will be added to as research continues, details what I consider to be the most notable facts. The earliest recorded reference to a fire on the Island was that of Brading Roman Villa circa AD 300. Although the fire described was 'devastating', the Villa continued to be an occupied site for another 100 years. 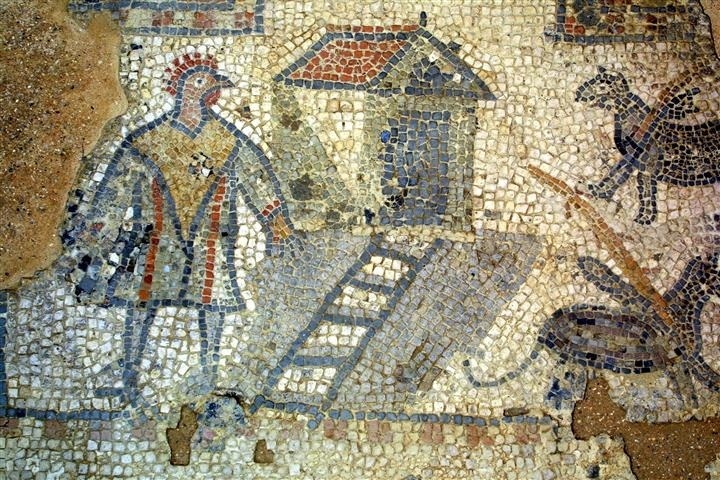 If anyone attempted to fight this fire they may have been members of the Roman Empire's Vigiles, one of the first if not the very first, organised fire-fighters in world history. 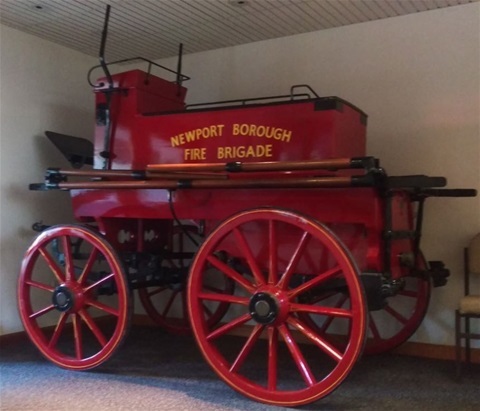 At some point either on, or before the year 1700, Newport possessed its first fire engine as referenced in the Ledger Book of Newport IW 1567-1799. 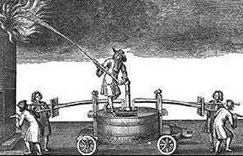 The manual engine, of a type unknown but almost certainly rudimentary in nature, was kept in the north aisle of St Thomas's Church under the care of the overseers of the poor. 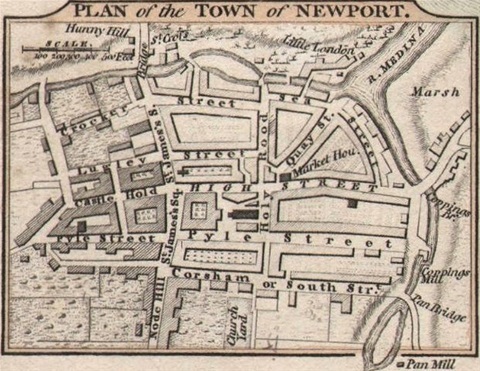 The Salisbury and Winchester Journal of 19 November 1785 reported a collosal outbreak of fire in Newport on the previous Sunday. Seventeen houses were destroyed and six others badly damaged with the loss of two lives. The Sun Fire Office gifted a manual fire engine to the town of Cowes in 1787. The engine remained in service for over 100 years. Despite being threatened for break-up the District Council eventually decided to keep it as a special antiquity. Sadly the pump, the actual one shown in the photo on the right, was destroyed by enemy bombing in May 1942. 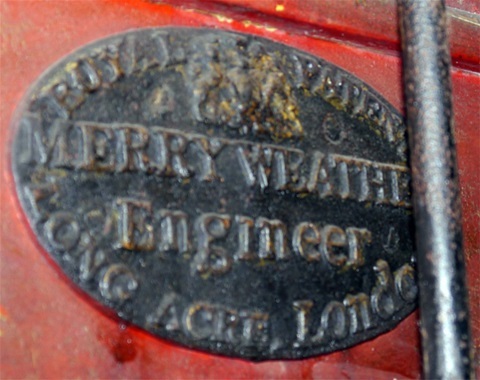 In 1848 Messrs. Merryweathers of London supplied Ventnor with it's first manual fire engine. 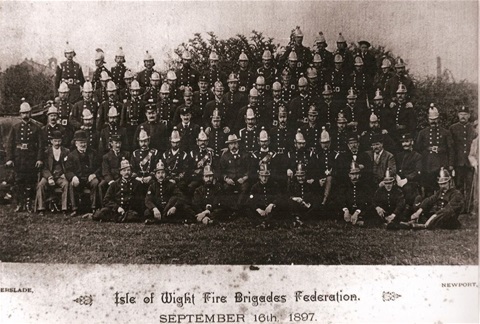 Ryde establish their first formal fire-fighting contingent, circa 1850. 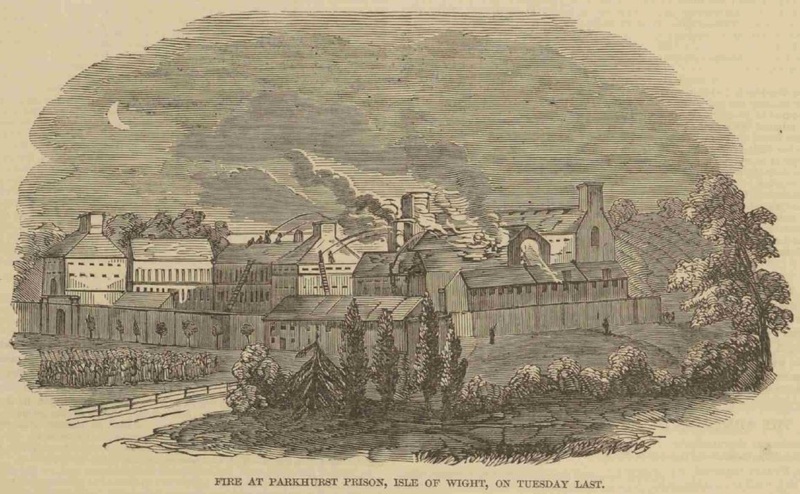 On 30 July 1850 a devastating fire at Parkhurst's Juvenile Reformatory becomes the first Island fire subject to extensive reporting, notably in the Illustrated London News from where the image on the right is extracted. 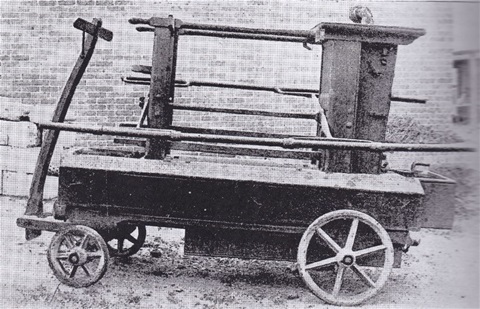 In 1852 Mr Jon Dashwood of Ryde placed an order for the Town to purchase two manual fire engines. One of these remained in service until 1908. Mr William Woods agrees to serve the town as Superintendent of the Fire Brigade in Ryde. A substantial conflagration burns at White's shipbuilders in Cowes. Both of the town's two engines attended in addition to that of Newport and White's own establishment engine but most notably five engines crossed the Solent from Portsmouth. Almost certainly this is the first Island example of cross-border working! With the installation of Ryde's waterworks and mains supply complete, Ryde Fire Brigade Superintendent William Woods revolutionises the methods used by the brigade as he finds the head of water supplied from the Ashey reservoir sufficient to strike even the highest buildings in the town. Woods drills his firemen to respond more rapidly with the lightweight hand-cart that carries only hose and branches, enabling the brigade to connect hoses direct to the fire-plugs for pressure and no need to drag out and operate the clumsy manual fire engines. Ryde's Town Surveyor produces the town's first hydrant map for use by firemen. West Cowes Local Board take the decision to purchase the town's first fire-escape ladder. 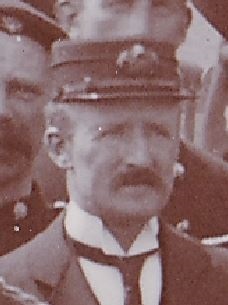 Mr W. Stannard is made Superintendent of Ryde Fire Brigade, his predecessor William Woods having retired due to poor health. Stannard resigned in December of the same year. John Langdon is appointed Superintendent of Ryde Fire Brigade. 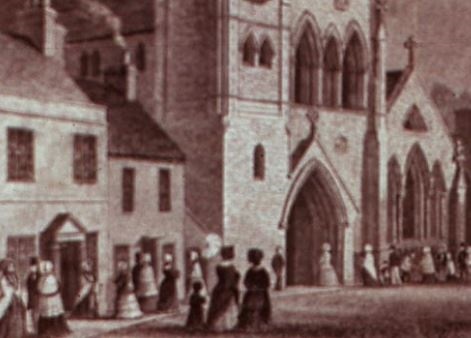 In 1866 Shanklin establish a self-determined fire brigade who are under the Superintendence of Mr Robert Blew and procure a fire-engine from the proceeds of a public subscription. Mr Frederick Mew is named as Superintendent of Newport Fire Brigade in the Borough List of Officials published in the Isle of Wight Observer. Following the resignation of John Langdon, Mr J.H. Burt is appointed Ryde Fire Brigade Superintendent. Following the short tenure of Superintendent J.H. Burt, command of Ryde Fire Brigade is handed to its Escape Conductor, Town Crier and Town Hall Keeper Henry Buckett. In a report of a fire at Luton Farm, Northwood, Cowes Fire Brigade's Superintendent is named as Mr Fellows. On this date a fire took place at Fernhill Cottage, Wootton. Newport Fire Brigade were reported to have responded with their new fire engine, which is the item later restored by former Freshwater firefighter Colin Fisher and which now adorns the foyer of the Isle of Wight Fire and Rescue Service, Learning and Development Centre at Ryde. In the same report Captain Reynolds is revealed as the Brigade superintendent. Ventnor Fire Brigade are sporting a new fire-escape ladder supplied for free by the Society for Saving Life from Fire. In a report in the Press regarding the size of the water mains in Ventnor, the town's fire brigade is reported to be led by Captain H. Owen. Sandown forms it's first fire brigade with Frank Cantelo as its captain. After just one year in charge Frank Cantelo resigns as Captain of Sandown Fire Brigade and Mr W. Jolliffe is appointed to the position. After barely a month in the role Mr W. Jolliffe resigns as captain of Sandown Fire Brigade and one of the firemen, James Dore is appointed Sandown's third captain in its thirteen month history. Mr Richard William Frampton is appointed as Captain of Ventnor Fire Brigade. 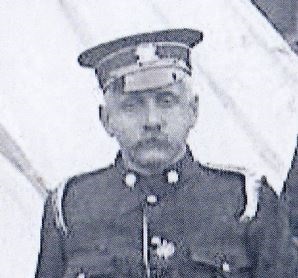 An Isle of Wight Observer report of a fire at Great Budbridge Farm, Merstone, reveals that Newport Fire Brigade is now under Captain Charles Osborne. A report of a drill session at Bonchurch reveals that Ventnor Fire Brigade is now in the command of Captain Frank Rennick. Cowes Fire Brigade enjoy their first formal annual dinner at the Town Hall, headed by a new Captain J.A. Sargeant. East Cowes appoint the Town Surveyor Mr Churchin as its first fire brigade Captain, but there's a problem... they don't have a brigade! After pondering over the estimated expense of running a fire brigade, East Cowes's Local Board elect to defer the matter until a later date. Mr Churchin's brief tenure as captain of no brigade is over. A bit of a rumpus at Cowes Fire Brigade Committee meeting is reported in the Isle of Wight County Press which names Mr Edney as fire brigade superintendent. Following some dissatisfaction with Shanklin's self-determined brigade at a recent fire, the Town Council take action and decide to form an official Town Brigade. Shanklin's Fire Brigade, the official one, is now established and a report of the brigade drilling alongside Sandown Fire Brigade reveals the Captain to be Dr David Lloyd. Charles Langdon is voted in as new captain of Ryde Fire Brigade. He is the son of former brigade superintendent John Langdon. Cowes Fire Brigade drill for the first time under new Captain Ernest Willstead. 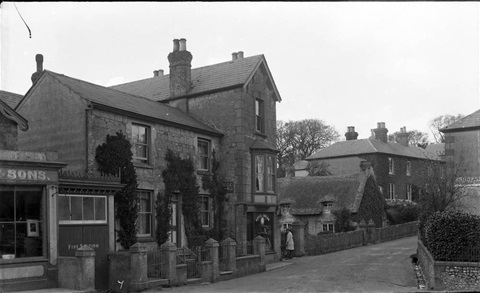 A fire at a Shanklin High Street store known as Daws is of such immensity and infamy that for many years after when relating other events townspeople could be hearing stating "before Daws" or "after Daws". A Press report regarding the dismissal of two firemen details that Captain Potts is now in charge of Shanklin Fire Brigade. 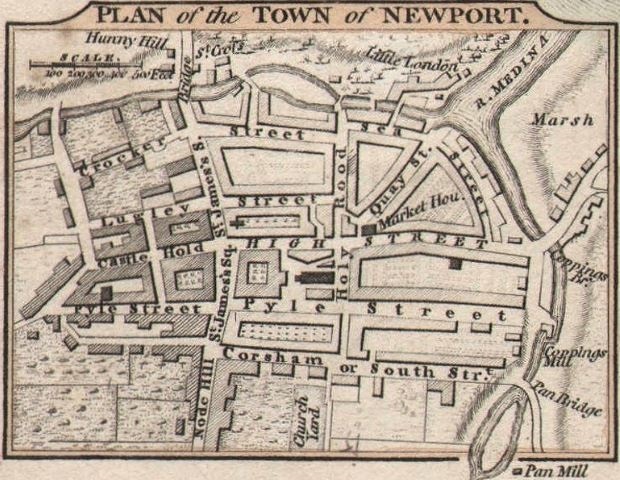 On this day Newport's firemen had their bluff called by the Town Council and effectively sacked themselves. Two months previous they had complained about the proposed pay rises and had threatened to resign on 18 February unless their demands were met. The Councillors called their bluff and recruited a new set of firemen who instantly took over where the others left off. As the Newport Volunteer Fire Brigade, these new firemen were willing to work without any pay whatsoever. Sadly Captain Osborne, who wasn't a party to the pay dispute, was inadvertently displaced when the Council allowed the new firemen to vote for a captain and they appointed Joseph Percy Shepard. As Osborne was not needed he was asked to leave. Captain Potts resigns as head of Shanklin Fire Brigade. 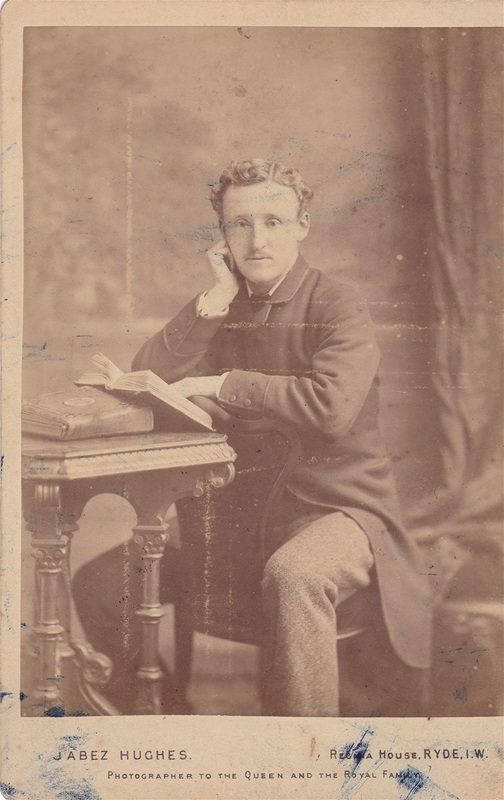 The brigade went without a formal head until 7 November when Oscar Horace Rayner was appointed. 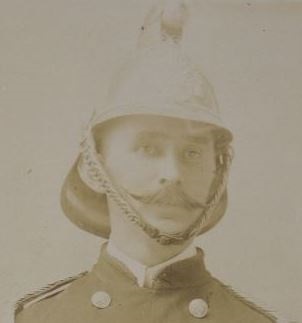 Rayner had been with the brigade since a 13-year old call-boy and more recently served as fireman and brigade secretary. Ryde's Captain Charles Langdon invited all other Island brigade captain's to a meeting at Ryde Town Hall in order to plan for a drill competition in the summer. 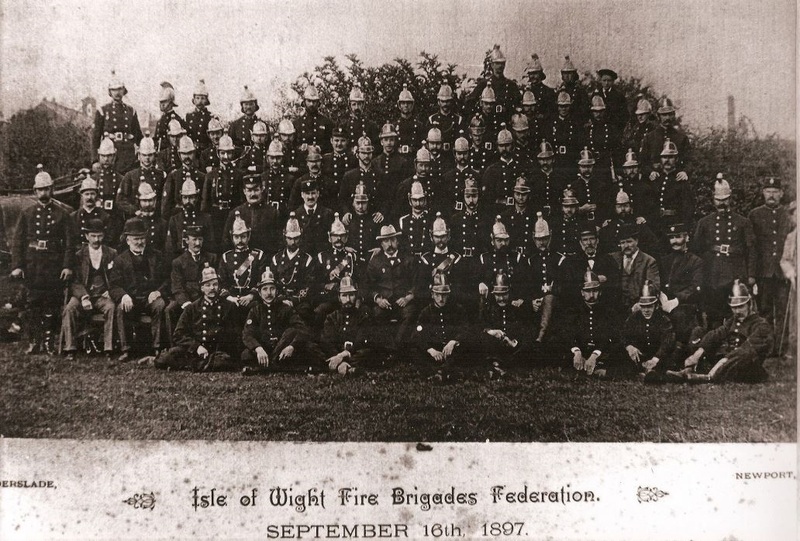 The result of this meeting was the creation of the Isle of Wight Fire Brigades Association, renamed the Federation in 1897. Newport's horse-drawn fire engine driver Kemp Mearman is hauled before the Magistrates to answer a charge of furious driving of the engine. The first Isle of Wight Fire Brigades Association drill competition is held at Simeon Street Recreation Ground, Ryde. Newport, Sandown and Cowes share the prizes on offer. 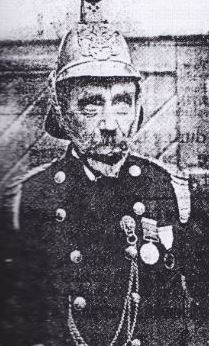 Captain Shepard resigns from Newport Volunteer Fire Brigade and is replaced by Captain Nicholas Henry Thomas Mursell, landlord of the Castle Inn in Newport's High Street. Charles Langdon, by now active as Honorary Secretary of the growing IWFBA, resigns his captaincy of Ryde Fire Brigade as a matter of principle after being denied an order for three lengths of new hose by the Town Council. Mr H.V. Carter is appointed in his place but with reservations as he is the first to be given a six-month trial period. The second IWFBA drill competition is staged at the County Ground, Shanklin. Newport, Sandown and Cowes brigades again share the spoils. Cowes Fire Brigade steal the ultimate glory by winning the Battenburg Challenge Cup. 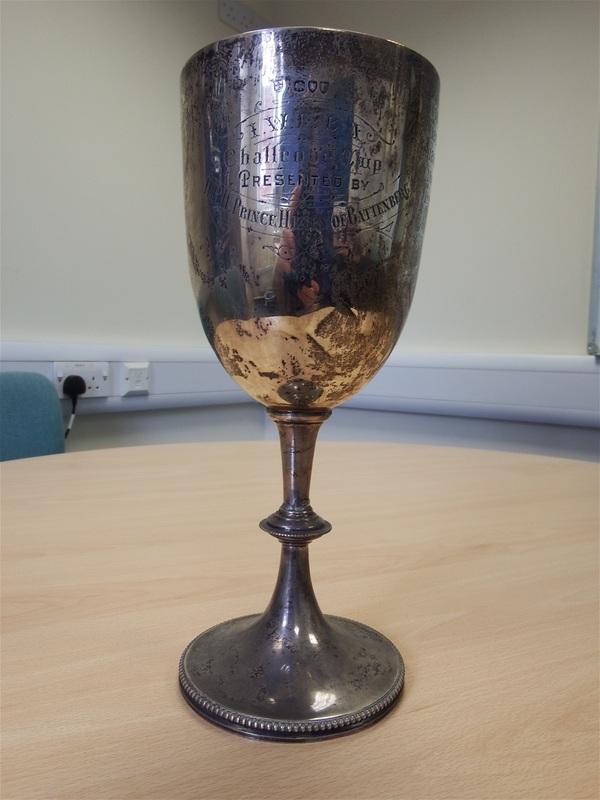 This was the first occasion this much coveted, yet plain in appearance trophy was competed for, donated to the IWFBA by Prince Henry of Battenburg. After a protracted period suffering with Bright's disease, Ventnor Fire Brigade's Captain Frank Rennick passes away aged 65. John Franklin Baker is appointed Captain of Ventnor Fire Brigade. A gentleman writes to the Isle of Wight County Press expressing his desire to establish a Binstead Fire Brigade. A power-struggle existed in Ventnor between the new Captain J.F. Baker and the Council's imposed brigade superintendent Mr T. Coleman (Ventnor were exclusive in this era for appointing a council member as a kind of executive officer above the brigade captain. The latter only commanded the firemen at fires; a matter that caused Baker's predecessor years of problems and which evidently the current captain chose to meet head on). 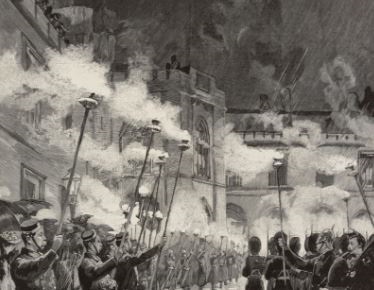 To end the power-struggle the Council agreed to Captain Baker's offer to stage a three-part drill decider between himself and his selected firemen and the Superintendent's selected favourites. Baker's team were substantially faster in all three efforts and the new captain was handed greater control over the brigade in all its activities. An Isle of Wight County Press report of a meeting reveals that the IWFBA is now the IWFB 'Federation'. Although Ryde's Captain H.V. 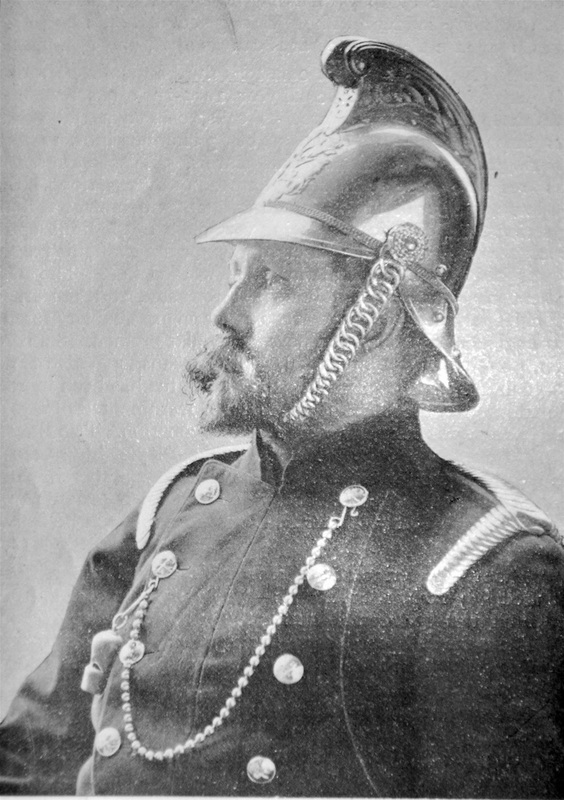 Carter substantially out-stayed his six-month trial period, he resigned in early 1897 and was replaced by the highly experienced Sidney Charles Sapsworth who moved to the Island shortly before and had previously held the position of brigade Captain of Richmond Fire Brigade in Surrey. Ventnor Fire Brigade's Captain Franklin is killed in a bizarre and unfortunate shooting accident on the Downs. Mr William Pearson is appointed his replacement on 1 July. Captain James Dore and a contingent of Sandown Fire Brigade attend the Queens Jubilee Review at Windsor. The third IWFBF drill competition is staged at Newport's Church Litten field. The hosts and Cowes Fire Brigade share the four prizes on offer but it was the visiting Cowes firemen that raised the coveted Battenburg Challenge Cup. Under mounting pressure to provide fire protection for their broad district, Councillors of St Helen's Urban District Council make a tenuous beginning with the installation of a hose store at Seaview. The fourth IWFBF drill competition is held at Ventnor Park. Sandown Fire Brigade won three of the four prizes on offer including the Battenburg Challenge Cup. East Cowes Councillors resurrected the plan for a brigade that they'd dropped due to cost over a decade earlier. Two weeks later the first four members of the proposed brigade were named and in December the Town Surveyor Mr F.A. Winder was appointed superintendent. Ventnor again played host to the IWFBF annual drill competitions. Shanklin took two first prizes including the Battenburg Cup, Newport's Fireman H. Smith won the one-man drill and the home team take the prize for the three-man drill. St Helen's Urban District Council have finally established a fire brigade at Seaview, which became the Seaview Section (alongside St John's and St Helen's) of the St Helen's Urban District Council Fire Brigade. On this date they drilled for the first time under Captain Dr Flemyng. Cowes host the annual IWFBF competitions and win two of the four categories but Ventnor win the Battenburg Cup. Spot the fire station... it's there if you look hard enough. Wroxall's plans to form their own Parish Fire Brigade come to fruition. 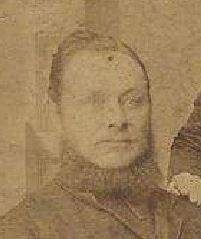 A brigade of fifteen men is named including its captain William Thomas Aldridge Holdaway. 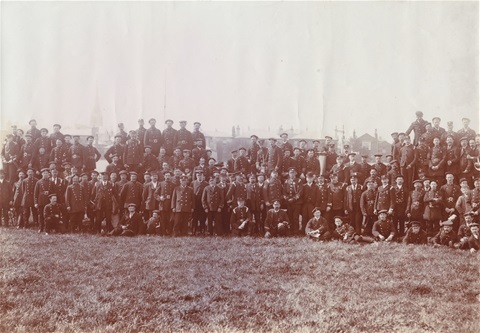 Ryde's Simeon Street Recreation Ground was the venue of the IWFBF competitions which this year were incorporated in to the meeting and drills of the NFBU Southern District. The host team won the first two drills but then faltered and Newport won the Battenburg Cup. Contingents from Sandown, Shanklin and Ryde's brigades all attended the International Fire Exhibition at Earls Court that ran from May to October. 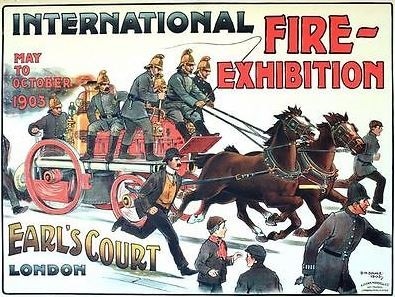 Ryde's pairing of Firemen George Pocock and Arthur Buckland proved so impressive in the early drills that the organisers, the British Fire Prevention Committee, asked to retain their services throughout the duration of the exhibition. Meanwhile Chief Officer Dore's networking enabled him to secure tea on the terrace at Westminster for himself and his firemen with Winston Churchill. Northwood Parish Council begin putting things in place to create their own fire brigade after being advised by Cowes Fire Brigade that they would not respond to fires in that district. On this date Bembridge Parish Council agreed a suitable site for the location of a fire station. This IWFBF competition was staged in a field off Carter Street, Sandown. The hosts' Fireman Wilfred Harry Brown carried off the one-man drill trophy but Shanklin won the next two categories and Cowes won the Battenburg Cup. Under Captain W.J. Westmore, Northwood Parish Fire Brigade conducted their first drill session on this day. Mr W.H. Lindsay took over the captaincy of Northwood Parish Fire Brigade today. At an IWFBF meeting held at Shanklin Town Hall, Mr G.H. Harrison resigns as President and an invite to join the Federation is to be sent to the emerging parish brigades with a promise that future drill competitions will include categories suitable for them to enter. This year's competitions were held at Glenbrook Paddock, Shanklin. Northwood's 1st team become the first winners of the Parish Hose-Cart drill. Shanklin win the one and two-man drills, Cowes the three-man drill and Ventnor take the Battenburg Cup. Newchurch Parish Council have formed a fire brigade and on this day announced that it is to be superintended by Captain J. Hayden and staffed by twelve firemen. 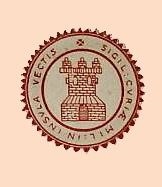 At a meeting in Newport's Guildhall, Charles Langdon, the catalyst behind the founding of the IWFBF, resigned as Honorary Secretary. East Cowes District Council came to an arrangement with their Cowes counterparts to be loaned Fireman Archibald Farrow as an instructor and fire station caretaker. Before long East Cowes found his additional experience invaluable to the brigade and appointed him Captain. Timeline continued on Timeline Page 2.